Literature, art, movies and much more to fly high! Anyone familiar with my work (and I say this with a smile, because I'm aware that's not as large a group as it ought to be) knows that I love history. I also have opinions about it, which I've written about before. I doubt very sincerely that very much of what we know of the events of our past is accurate. We have history books. We have journalistic accounts. We have diaries and biographies and even stories passed through families from generation to generation, but all of them are colored by society, prejudice, and simple error. None of that is what matters. What matters is that we keep that past alive – that we don't let our history escape us. I live in a state with one of the longer domestic histories, North Carolina. When British governors ruled the day, Quakers inhabited this area; plantations grew where forests and fields had stood. In other words, Americans put down roots. Thankfully, those roots are deep here. There are homes dating back to the 1600s. There are families who have lived here – literally –for centuries. A lot of the history has been preserved, and there is more out there to be unearthed. We regularly haunt estate auctions, thrift stores, anywhere something might turn up that has a secret. Before moving to North Carolina, most of my stories and novels were set in a few fictional cities I created that were cobbled together from my past. There is Random, Illinois – loosely based on a mixture of my hometown, Charleston, Illinois, and the much smaller town where my grandparents lived, Flora, Illinois. I also created San Valencez California, my own version of San Diego, and her sister city of Lavender, California – a smaller, more suburban area. Now I live in the south. Not the Deep South, like Alabama, or Mississippi, but the old south. You can feel it when you drive down streets of Colonial and Victorian homes, you can read it on the gravestones in the cemeteries. It has soaked into my imagination, and I've begun writing a lot of fiction based here. Some of it is funny, some of it is serious – all of it is as authentic as I can make it. 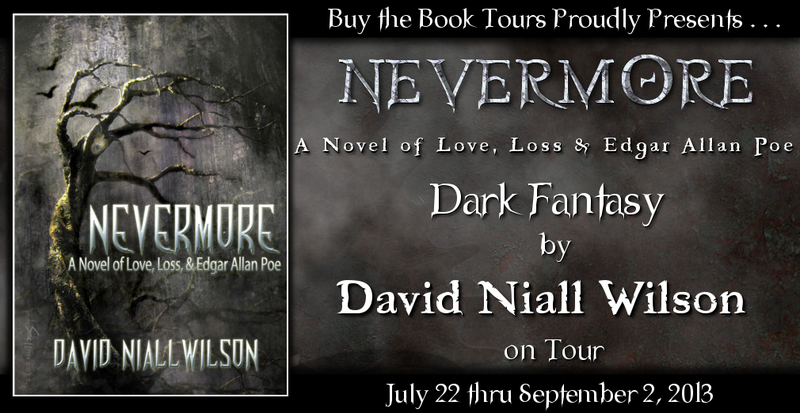 In my most recent novel, Nevermore, a Novel of Love, Loss & Edgar Allan Poe, I've drawn on several of the things I've grown to love. The Great Dismal Swamp. The Intercoastal Waterway that stretches from Florida to Virginia and that was – in part – surveyed by a young man named George Washington. The Lake Drummond Hotel, an almost legendary place that rested on the border of two states for a short period of time and attracted outlaws, dignitaries, and travelers of all types – including a young author and poet named Edgar Allan Poe. There are holes in that story. It is known that Poe stayed at the hotel. It is also known – or at least assumed – that his poem "The Lake" – was written about Lake Drummond, which lies not far into the Dismal Swamp, and not far from the waterway, or the site of The Hotel Drummond. Rumor has it that Poe wrote an early draft of his most famous poem, The Raven, while staying at the Lake Drummond Hotel. The holes? No one can prove that he wrote The Raven there. On the other hand, research shows me that no one can say for certain where he did write it. There is another hole, and this one is much more important. This poem was written for a lost love – a woman named Lenore. No one has ever adequately answered the question of her identity. There are theories. Many women in Poe's life, starting at a very young age – died. Nevemore is my way of filling those holes. My Edgar Allan Poe has a dark magic that bonds him with his companion, Grimm, a very old crow, and with the visions that bring his stories. Lenore is an artist with a special gift of her own. As the story unfolds, their fates become one – and they are drawn into a story much older and darker than either of them could have imagined. As writers do, I have taken liberties with history. I have taken liberties with Poe, and The Lake Drummond Hotel (of which very little information is known). I have added in other local legends, because the Dismal Swamp is full of them, and Edgar and I – as a collaborative team – have taken liberties with one of The Brothers Grimm's fairy tales. A story titled The Raven. I hope you'll find my book, and read it. I hope you'll enjoy the cover art, created by the amazing kinetic artist Lisa Snellings. Some of you might want to listen to the unabridged audiobook, narrated by Gigi Shane. You can find more about me and about my writing at my web site. Thanks for having me, Maria Grazia. 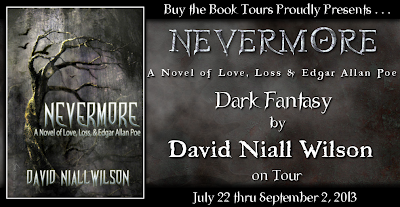 David Niall Wilson has been writing and publishing horror, dark fantasy, and science fiction since the mid-eighties. An ordained minister, once President of the Horror Writer’s Association and multiple recipient of the Bram Stoker Award, his novels include Maelstrom, The Mote in Andrea’s Eye, Deep Blue, the Grails Covenant Trilogy, Star Trek Voyager: Chrysalis, Except You Go Through Shadow, This is My Blood, Ancient Eyes, On the Third Day, The Orffyreus Wheel, and Vintage Soul – Book One of the DeChance Chronicles. The Stargate Atlantis novel “Brimstone,” written with Patricia Lee Macomber is his most recent. He has over 150 short stories published in anthologies, magazines, and five collections, the most recent of which were “Defining Moments,” published in 2007 by WFC Award winning Sarob Press, and the currently available “Ennui & Other States of Madness,” from Dark Regions Press. His work has appeared in and is due out in various anthologies and magazines. David lives and loves with Patricia Lee Macomber in the historic William R. White House in Hertford, NC with their children, Billy, Zach, Zane, and Katie, and occasionally their genius college daughter Stephanie. One dark, moonlit night, two artists met at The Lake Drummond Hotel, built directly on the borderline of North Carolina and Virginia. One was a young woman with the ability to see spirits trapped in trees and stone, anchored to the earth beyond their years. Her gift was to draw them, and then to set them free. The other was a dark man, haunted by dreams and visions that brought him stories of sadness and pain, and trapped in a life between the powers he sensed all around him, and a mundane existence attended by failure. They were Eleanore MacReady, Lenore, to her friends, and a young poet named Edgar Allan Poe, who traveled with a crow that was his secret, and almost constant companion, a bird named Grimm for the talented brothers of fairy-tale fame. The room was low-ceilinged and deep. Smoke wafted from table to table, cigars, pipes, and the pungent aroma of scented candles. Laughter floated out from the bar, separated by a low half-wall from a small dining area, where the bartender regaled the crowd with a particularly bawdy story. In the corners, more private conversations took place, and at the rear, facing the Intercoastal Waterway beyond, the door stood open to the night, letting the slightly cooler air of evening in and the sound and smoke free. The smoke prevented the illumination from a series of gaslights and lanterns from cutting the gloom properly. Smiles gleamed from shadows and the glint of silver and gunmetal winked like stars. It was a rough crowd, into their drinks and stories, plans and schemes. Along the back wall, facing a window that looked out over the waterway and the Great Dismal Swamp beyond, a lone figure sat with her back to the room. Her hair was long and light brown, braided back and falling over her shoulder to the center of her back. She was tall and slender with smooth, tanned skin. She was dressed for travel, in a long, floor length dress that covered her legs, while allowing ease of motion. The crowd swirled around her, but none paid her any attention. She paid no attention to anything but the window. Her gaze was fixed on the point where an intricate pattern of branches and leaves crossed the face of the moon. There was a sheaf of paper on the table, and she held a bit of chalk loosely between the thumb and index finger of her right hand. She formed the trees, the long strong lines of the trees, the fine mesh of branches and mist. Her fingers moved quickly, etching outlines and shading onto her sketch with practiced ease. A serving girl wandered over to glance down at the work in progress. She stared at the paper intently, and then glanced up at the window, and the night beyond. She reached down and plucked the empty wine glass from the table. The woman glanced up. Her expression was startled, as if she’d been drawn back from some other place, or out of a trance. She followed the serving girl’s gaze to the paper. Among the branches, formed of limbs and leaves, mist and reflected light, faces gazed out, some at the tavern, some at the swamp, others down along the waterway. They mixed so subtly with the trees themselves that if you were not looking carefully, they seemed to disappear. “You are a crazy woman,” the girl said. There was no conviction in her words. She continued to stare at the sketch. Then, very suddenly, she stepped back. She stumbled, and nearly dropped her tray. The woman glanced up at her sharply. “That…face.” The girl stepped back to the table very slowly, and pointed to the center of the snarl of branches. The tip of her finger brushed along the lines of a square-jawed face. The eyes were dark and the expression was a scowl close to rage. The artist held out her hand. The girl nodded. She glanced down at the drawing again and stepped back. Then she stumbled off into the crowded tavern and disappeared. Lenore stared after her for a long moment, brow furrowed, then turned back to the window. The moon had shifted, and the image she’d been drawing was lost. It didn’t matter. The faces were locked in her mind, and she turned her attention to her wine glass, and to the paper. The basic design was complete, but there was a lot of shading and detail work remaining. She had to get the faces just right – exactly as she remembered them. Then the real work would begin. Even as she worked, her mind drifted out toward the swamp, and toward her true destination. She didn’t know the exact location of the tree, but she knew it was there, and she knew that she would find it. She didn’t always see things in her dreams, but when she did, the visions were always true. A breeze blew in through the open window, and she shivered. The face she was working on was that of an older man. He had a sharp, beak of a nose and deep-set shadowed eyes. The expression on his face might have been surprise, or dismay. His hair was formed of strands of gray cloud blended with small twigs and wisps of fog as she carefully entered the details. There were others. She’d counted five in all, just in that one glimpse of the swamp. She thought she could probably sit right here, at this window, and work for years without capturing them all. How many lives lay buried in the peat moss and murky water? How many had died, or been killed beside the long stretch of the Intercoastal Waterway? She tilted her head and listened. The breeze seemed to carry voices from far away, the sound of firing guns, the screams of the lost and dying. She worked a woman’s features into a knotted joint in one of the tree’s branches. The face was proud. Her lip curled down slightly at the edge, not so much in a frown, as in determination. Purpose. From the strong cheekbones and distinctive lines of the woman’s nose, Lenore sensed she’d been an Indian. How had she come here, soul trapped fluttering up through the sticky fingers of the ancient trees? Around her, the sounds of revelry, arguments of drunken, belligerent men, clink of glasses, full and empty, and the sound of a lone guitar in a far corner surrounded her. She felt cut off – isolated in some odd way from everyone, and everything but the paper beneath her fingers. Now and then she paused, reached out for her glass, and sipped her wine. No one troubled her and that in and of itself, was odd. A woman – an attractive woman – alone in a place like the Halfway House was an oddity. She should have been a target. She was not. A few men glanced her way, but something about her – the way she bent over her work, the intensity of her focus – kept them away. She worked steadily, and one by one, the others drifted out the doors, some to rooms, others to wander about with bottles and thoughts of their own. Eventually, there were only a few small groups, talking quietly, the bartender, and the girl. There was nothing more she could do. She had drawn an eerily accurate recreation of the trees over the waterway, and of the five faces she’d found trapped in their branches. She sensed things about them but knew little. She did not need to know. She knew that she had to set them free, to allow them to move on to the next level. Something had bound them – some power, or some part of themselves they were unwilling to release. They did not belong, and though she knew that most of the world either ignored, or did not sense these things at all – she did. All those trapped, helpless beings weighed on her spirit like stones. She was fine until she saw them, but once that happened, she was bound to set them free. It was her gift – her curse? Sometimes the two were too closely aligned to be differentiated. She rose, drained the last of the wine in her cup, and gathered her pencils. She tucked the drawing into the pocket of a leather portfolio, careful not to smudge it. Soon, it would not matter, but until she’d had a chance to finish her work, it was crucial that nothing be disturbed. The girl, who had been busy wiping the spilled remnants of ale, wine, and the night from the various tables and the surface of the bar, wandered slowly over. The girl nodded. She glanced over at the bartender, then turned back. “I will come soon,” the girl said, turning and hurrying back toward the bar. Lenore watched her go, frowned slightly, and then turned. She had to exit through the front door and follow a long porch along the side of the building where it turned from the saloon in the center to a line of rooms on the Carolina side. There were similar rooms on the Virginia side, but her business was in the swamp, and the corner room gave her a better view of what lay beyond. As she made her way to her room, she heard the steady drum of hooves. She stopped, and turned. A carriage had come into view, winding in from the main road that stretched between the states. It was dark, pulled by a pair of even darker horses. She stood still and watched as it came to a halt. Something moved far above, and she glanced up in time to see a dark shape flash across the pale face of the moon. A bird? At night? She glanced back to the carriage to see it pulling away into the night. A single figure stood, his bag in one hand. He glanced her way, nodded, and then turned toward the main door of the saloon. He was thin, with dark hair and eyes. It was hard to make his features out in the darkness, but somehow she saw into those eyes. They were filled with an odd, melancholy sadness. As he passed inside, it seemed as if his shadow remained, just for a moment, outlined in silvery light. Then it was gone. Lenore shook her head, turned, and hurried to the door to her room. She fumbled the key from her jacket pocket, jammed it into the lock, and hurried inside. She had no idea why the sight of the man had unnerved her, but it had. And the bird. If she’d woken from a dream, she’d have believed she was meant to set him free…but she was very, very awake, and though her fingers itched to draw – to put his image on paper and tuck it away somewhere safe, she knew she could not. Not now – not yet. There was not much time before dawn, and she still had work to finish – and a story to hear. The stranger, if she ever returned to him, would have to wait. She lit the oil lamp on the single table in her small room, opened the portfolio, and laid the drawing on the flat surface. There was a small stand nearby, and another bottle of wine rested there. She had two glasses, but had not known at the time why she’d asked for them. Another vision? She poured one for herself, and replaced the cork. Moments later, there was a soft rap on the door. When she opened it, the girl stood outside, shifting nervously from one foot to the other and looking up and down the long porch as if fearing to be seen. The girl did so, and Lenore closed the door behind them. “What shall I call you?” she asked, trying to set the girl at ease. Something had her spooked and it would simply not do to have the girl bolt without spilling her story. The girl nodded. Lenore poured a second glass from her bottle and handed it over. The girl glanced sharply over, nearly spilling her drink. Lenore pulled out her pencils, and a gum eraser. Lenore listened, and worked, rearranging branches, shifting the wood slightly, picking the strong woman’s face to release from the pattern first. Anita’s voice droned in the background – and she faded into the story, letting it draw her back across the years as she carefully disassembled her drawing, working the faces free. cool! love Poe. He used to frequent a hotel (now a restaurant) in my hometown in Delaware. Now, I live closer to Baltimore--another one of his haunts, and his final resting place. I suspect that my fiction hasn't seen the last of Mr. Poe...maybe I'll take him up your way one day soon. Oh love the scary cover and font! FREE APP - READ KINDLE BOOKS EVERYWHERE! Don't you have an e-reader yet? No need to buy one. Read kindle books on your computer, iPad, smartphone! Click and discover how. BBC THE PARADISE SERIES 2 - WHAT IS GOING TO HAPPEN TO DENISE & MORAY? DREAMING OF BEING THERE, IN PARIS WITH ... MONET! about my experience as a blogger and especially as the editor of "The Everything Austen Daily"- If you want to know more about it (and about me), just click on the pic. THE WHITE QUEEN AND A GREAT KING, RICHARD III. SCHOOL CAN BE FUN . AT LEAST, FOR THE TEACHER. POETRY, LIFE AND ...NIGHT DREAMS. PERIOD & MORE PERIOD - POLDARK, THE MUSKETEERS 2, BANISHED AND ... OUTLANDER! RA FRIDAY - WATERBOARDED , HE SPOKE! GRATITUDE GIVEAWAY HOP - THANKS TO ALL MY READERS AND FOLLOWERS! IT IS FAR MORE HONOURABLE TO FAIL THAN TO CHEAT ... AT SCHOOL AND NOT ONLY THERE. Share book reviews and ratings with Maria Grazia, and even join a book club on Goodreads.